Pours clear but dark with no persistent head, nice lacing of bubbles across the surface. Nose of burnt caramel sugar, like you imagine candy tasted when you were little. Upon tasting, tiny champagne bubbles tickle the tongue. This beer is heavily boozy, the alcohol note is overwhelming and could put out those who don’t like a high octane beer. Squash notes at the end but very little spice if any. Note: Spice presents more when warm but as this is poured cold I reviewed at temp. This comes in a 22oz bottle of candy corn scented stout goodness. This bottle either says “share me with a friend!” Or “Carry me around the costume party drinking straight from the bottle!”, I’ll let you guess my method of choice. Due to the high booze nature (10%) it’s definitely a sipping beer, but packs a whallop no matter what, so call the car service of your choice and enjoy that bottle, you deserve it! Score: 85/100, I want more spice, gosh darn it. 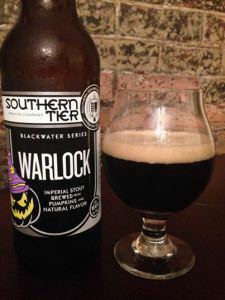 Some forms of black magic have longer staying power when coupled with particularly powerful conjurers, and the imperial stout that Southern Tier introduced a couple years back hit the pumpkin beer drinking world with a powerful holding spell. Would the magic still be there in my third year of drinking it? Pouring the same deep black with tints of red in the light, something seemed different. The body seemed lighter, and the once opaque imperial now had a much clearer appearance when light penetrated it’s vast darkness. The aroma released a roasted caramel and vanilla sugary waft with just a touch of chocolate to it. This 10%er hits with a lot of forward roasted malt and dark chocolate combined with big pumpkin that manages to cut thru the dense smoke. 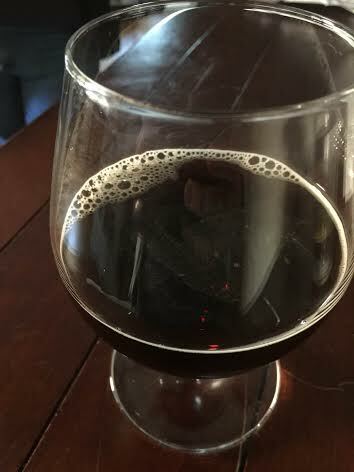 Once this stout begins to warm, more butterscotch notes peek through with a vanilla swirl and faint cardamom, all sealed off with an alcohol burn in the finish that wasn’t there in past years.